Is réigiún suite sa Tuirc, An tSiria, An Iaráic agus An Iaráin í an Chordastáin (Coirdis: Kurdistan nó کوردستان). 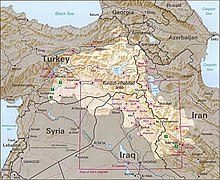 Tá ceithre cheantar sa gCordastáin: Rojava (An Chordastáin Thiar sa Siria), Bakûr (An Chordastáin Thuaidh sa Tuirc), Başûr (An Chordastáin Theas san Iaráic), agus Rojhilat (An Chordastáin Thoir san Iaráin). Tugadh an leathanach seo cothrom le dáta an 30 Meitheamh 2018 ag 02:33.